This is the first ‘review’ of an independent restaurant posted on The Munch and Tattle and probably the only one that will be of a restaurant in Newport, South Wales for a long time. 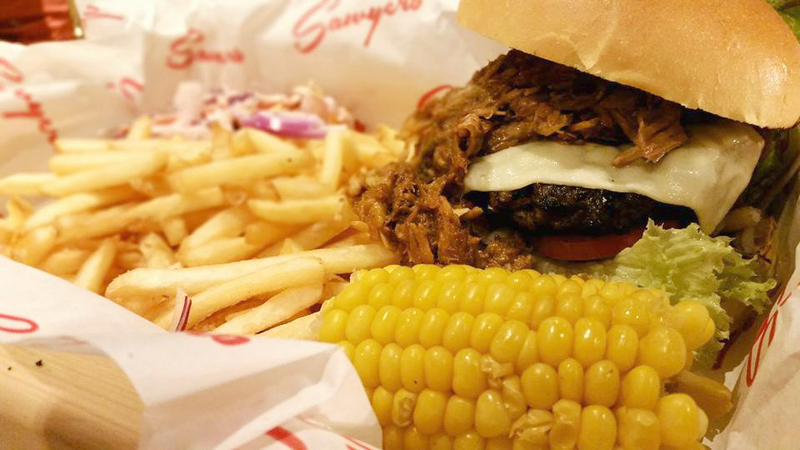 I will review both the ribs and the pulled pork burger from Sawyers Bar and Grill. Although there are places to eat in Newport, there aren’t too many stand out places that everyone loves to go for good quality food and in particular, barbecue and grill. Sawyers Bar and Grill only opened it’s doors on 22nd of August, 2014 and I didn’t wait long to have a go. Sawyers bar and Grill is really the only place in Newport serving this type of food. Nowhere else can you get slow cooked ribs that aren’t tiny, tough or microwaved. So naturally, I was extremely excited to try them. At first I thought it was part of a franchise or chain that I just hadn’t heard of. I became much more interested when I found out that on my first visit, waiting for my food to come, I was speaking to the founder of Sawyers who confirmed that this was the first. He was obviously passionate about the food, he was doing something he loved and Sawyers Bar and Grill is proving very successful as a result. The first time I went to Sawyers I had to get it to take away. They didn’t even have a takeaway menu yet so he talked me through the menu and offered suggestions. I asked if I could have the ribs to takeaway and he said yes. I did have to wait a little while but that was to be expected if I turned up without pre-ordering asking for a full rack of ribs. I chatted to him for a while about the business and his plans. He personally checked on my order a few times and it was generally a good experience and a very friendly atmosphere. My meal came in a Pizza box because it was the only thing big enough to fit the slab of ribs I had ordered. I also ordered a Philly Steak Sandwich for my partner which looked equally delicious. I jumped into the car and rushed home to eat it. I have since found out that the ribs are not actually available on the takeaway menu. Ill start with the Ribs and then discuss the rest of the meal. I don’t think £15.95 for a ‘Large Slab’ of ribs is bad at all. I would expect something like this to be much more expensive in even the most reasonably priced restaurants. Both times I have had these ribs I have struggled to finish the meal because you just get so much! 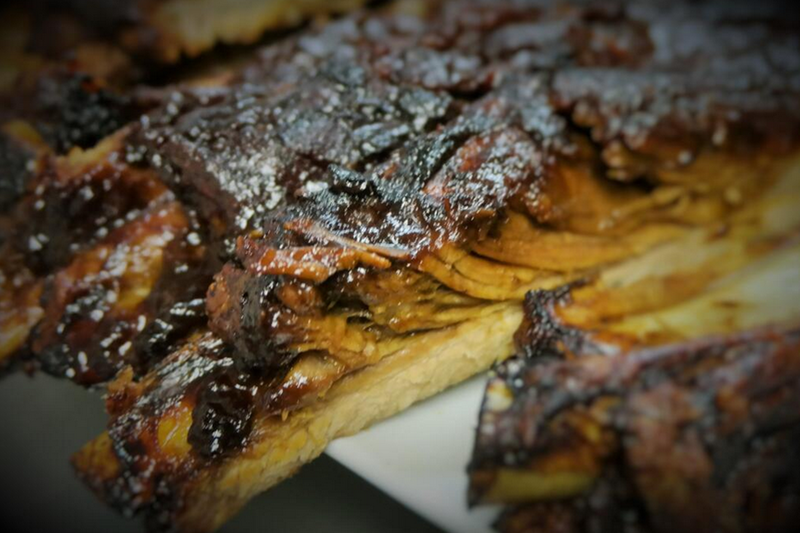 You can see that there is enough meat for any barbecued rib lover to enjoy and not walk away hungry. So we know it is big but how does it taste? The ribs are rubbed in their blend of herbs and Spices and slowly cooked, topped off with a delicious homemade BBQ glaze. The meat is unbelievably tender so the meat comes right off the bone and the flavours are incredible. It sounds like it would taste great and it does not disappoint! The meat is well seasoned and the barbecue sauce is full of flavour. What more can you ask for? 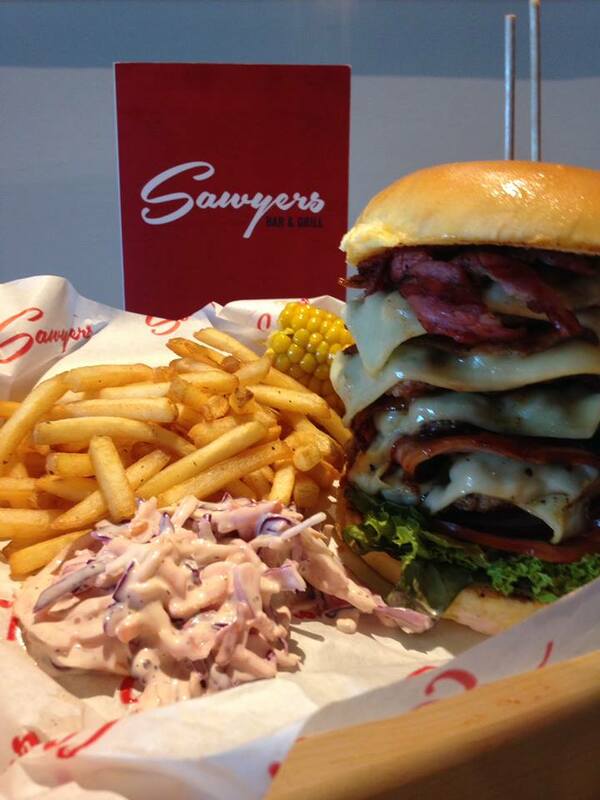 If you only have one opportunity to visit Sawyers and your stuck for something to order. Order the ribs! Next on the plate you have the homemade slaw, buttered corn on the cob and fries. The slaw is a perfect for the meal. It’s fresh and creamy, and the crunchy texture works well with the meat. The buttered corn on the cob is great. A good side to have with any grilled meal. The fries…. Well they’re fries…. You do get a lot of them. I would definitely recommend upgrading to the sweet potato fries which are much better. Now for the Pulled Pork Burger. Again, I will start by telling you what you get first and then give my impressions. You might think that £10.95 is quite expensive for a burger but it is not. The burgers you get many of the popular high street restaurants are bought in and nowhere near as good in terms of quality. It is also a very big burger. You will definitely not leave feeling as though you are still hungry. I had to order the burger to take away (burgers are not on the takeaway menu) so it ended up being a little squashed in the box and didn’t photograph well at all. When I called they said that I could order anything to take away other than the ribs, pasta or steak. I presume this is because they know that the experience wouldn’t be quite as good if you take this food away. To be honest, I wouldn’t recommend taking the burgers away if you want the best possible experience. Overall, the burger was great. The patty itself is well seasoned, juicy and you certainly get enough of it. You do have the option to double up if you would like but there really is no need unless you want to show off how much you can eat. You can also add a few optional extras if you wanted. I added Monterey Jack cheese. The pulled pork is the highlight of the burger. The bbq pulled pork is where all the flavour comes from. It is very similar in taste and texture to the rib meat and I like it. This was all sandwiched between fluffy and sweet brioche bun, a few leaves of lettuce and a slice of tomato. For sides, I had regular fries, buttered corn on the cob and the homemade slaw. These were all just as good as the time I had the ribs. Again, I would recommend upgrading to the sweet potato fries. Although the burger is great and I would definitely recommend it. I do feel as though something could be added to take it to the next level. I hope that my review has convinced you to visit Sawyers Bar and Grill because they are really worth a try. The staff are extremely friendly and the food is good. I would suggest having a look at their menu because the selection is great. You can choose to eat pizza, pasta, burgers, steak, ribs, hot dogs and more. There will be something for everyone. If you would like to order something that is really a show stopper (and money is not and issue) you can really create some masterpieces. 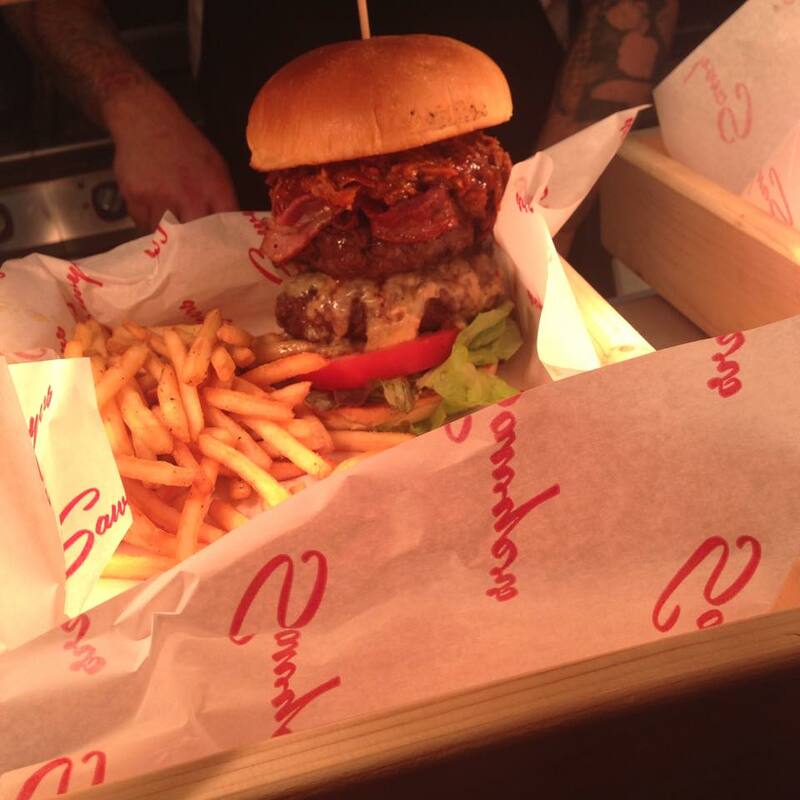 Just looking through Sawyer Twitter and Facebook feeds you will find images of incredible looking burgers ‘designed’ by the customers. I think they should make a bigger deal of this! Make (almost) any burger you want! So in conclusion. 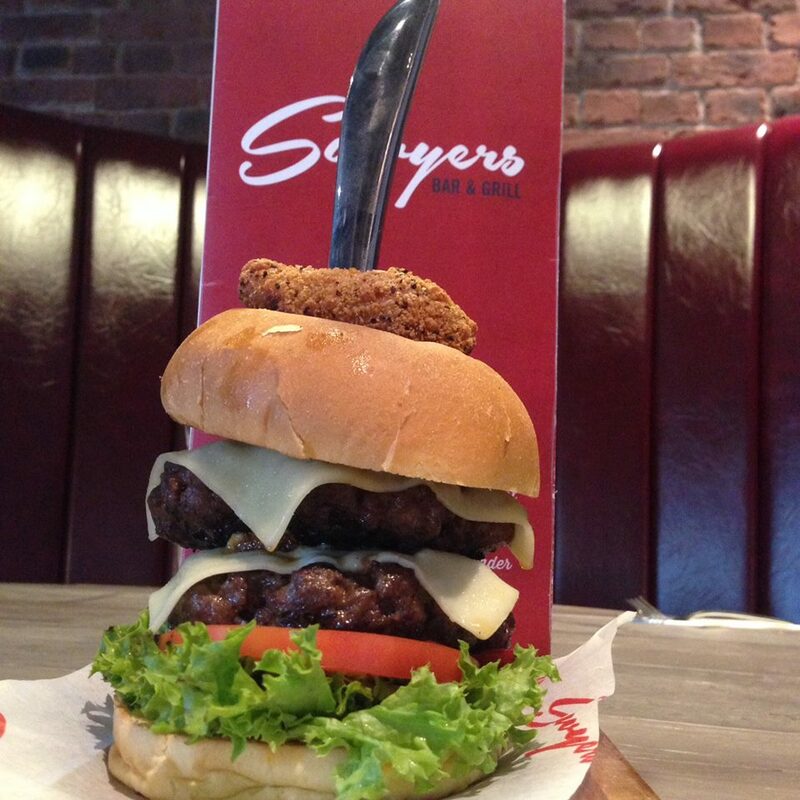 Sawyers Bar and Grill is a small, friendly place to have a great meal in Newport. I would definitely recommend going and trying the ribs in particular. Previous PostBook Review: Jamie Oliver’s Comfort Food.Next PostNicholls Abergavenny: Butterflied Chicken Breast, Stilton Sauce and Seasonal Vegetables. Hi 🙂 Thanks for the feedback and I’m glad you liked it. I did wonder but the Sawyers website says Newport, so I went with Newport. I guess it would be right on the border but technically in Monmouthsire. That last burger looks amazing!!!! I think I need to get there sooooooon. Yeah that’s pretty much my attitude when it comes to food like that haha.